Ever since his baby brother Will was born eight months ago, Jonah's life seems to be getting worse and worse. His sixteen-year-old brother Jesse has severe food allergies that make it hard to even live in his own home, and he's having more reactions lately. Will won't stop crying, and Dad and Mom seem pretty clueless. Jonah knows that when a bone breaks, it grows back stronger…so he sets out on a mission, breaking his bones to become stronger through skateboard “accidents”. But will his only release break him? Hannah Moskowitz's debut novel is startling, blunt, and complete absorbing. Jonah is a wholly believable character, and the first person narrative makes it easy to immerse yourself into the story, but will also have you cringing constantly as Jonah plans out which bones he will break next, keeping a tally, and carries out his schemes. Moskowitz is skilled at balancing a myriad of issues that threaten to overwhelm Jonah: his worries and fears for his brothers, friend issues, guilt, and the need to protect everyone, making them believable and engrossing. The pacing of the novel is excellent; Jonah's dry sense of humor help keep the plot from being too morbid, and Moskowitz's dialogue is pitch-perfect. Though Jonah does allude to certain issues that happened in the past and might have been interesting to learn more about, and the wrapping up of the novel is slightly confusing, the style and pace do stay consistent, making for a riveting and suspenseful read, and the ending isn't cookie-cutter perfect and unbelievable. 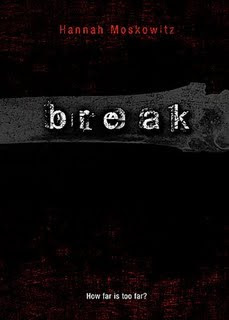 Break is both gruesome and stunning, one of those books you cringe to read but can't put down. Cover Comments: This is an excellent cover; it's simple, but quite effective. I like how it isn't completely black and white and red, but has the gray in it, and and the broken bone on the cover has the appropriate effect. My immediate thoughts: creepy/bizarre/awesome. I think I'll like this book. Great review! Add this one to my TBR-- anything with skateboarding in it is so rare, and problem novels are popular with my 8th grade boys. Thanks!